A popular Brentwood dog park on Veterans Administration property is build over an old radioactive waste dump that may soon be unearthed by proposed development. SUVs and luxury sedans glide into the Barrington Dog Park parking lot just south of Sunset Boulevard in Brentwood. Industry types and soccer moms chatter away on cell phones as they pop out of their vehicles with their canine charges. Beagles and boxers bound onto the pavement ready to romp with regulars like Australian Shepherd dogs named Mick Jagger and Bella and pugs called Lola, Daphne and Spanky. The park is popular with Brentwood resident Dustin Hoffman and other celebrities including Kirstin Dunst and Owen Wilson. The Brentwood Dog Park hosts an annual “Bow wow ween” in October, officiated by “NoTORIous” television star and head dog contest judge Tori Spelling whose seven-year-old pug is named Mimi La Rue. The 2004 show attracted 1,500 canine and feline lovers and held a silent auction with items donated by George Clooney,Courtney Thorne-Smith and James Gandolfino. Bow wow ween featured a mobile microchip clinic, dog masseuse, a canine costume contest and even a cat cemetery with mock tombstones. The dog park’s Halloween festivities might not be too scary, but what lurks beneath its soil is downright frightening. Unbeknownst to pet owners, the off-leash park is partially situated over an old nuclear and chemical dump. From (1948) to 1968, UCLA and the West LA Veterans Administration, now called the Veterans Affairs West Los Angeles Healthcare Center, used the land adjacent and under the park to get rid of radioactive biomedical research waste on the northwest reaches of the VA.
Now this forgotten radioactive waste, hazardous for thousands of years, has come back to haunt the VA which is looking at options to develop the land ostensibly to help the cash-strapped department. In the process PricewaterhouseCoopers, the VA’s contractor on the project, has reported that the nuke dump is even larger than previously known and is under the athletic fields of the VA-adjacent Brentwood School. Faced with questions about these hottest revelations, the VA has falsely portrayed the dump as harmless, employing bad science and obfuscation to hide the dregs of years of oft-time bizarre and cruel animal and human radiation experimentation conducted by the VA and UCLA for decades in the last century. The VA and UCLA were part of America’s Cold War massive enterprise to understand the biological effects of radiation on humans and animals. These efforts produced radiation waste that was disposed of as easily as burying, say, a dead animal. Carcasses of radioactive lab dogs, cats and a menagerie of animals make up around half of the toxic trash deep-sixed in the dirt off of Barrington Avenue. The dumping was done before regulations were created to carefully control the insidious threat that unencumbered rad waste disposal poses. Barrels full of radioactive tritium, carbon-14 and at least thirteen other isotopes, along with contaminated biomedical lab waste, were also tossed or poured into this dump in trenches and holes with nary a record of the dumping for the first years of operation. One prevalent radionuclide in the dump is carbon-14 with a half-life of 5,730 years. The location was also used as a chemical waste disposal site for the VA and UCLA. The heart of the dump lies in a ravine below the dog park surrounded by chain link fence with fading paper warning signs. The abyss is accessible from adjacent VA athletic grounds, MacArthur Field, used by hundreds of young soccer players who often have to retrieve errant balls in the arroyo through unsecured gates. A central dirt mound of plant-covered debris sits in the middle of the dump emitting high ambient radiation readings. This reporter, using a nuclear radiation monitor, detected shards of radioactive glass that registered over four times normal. 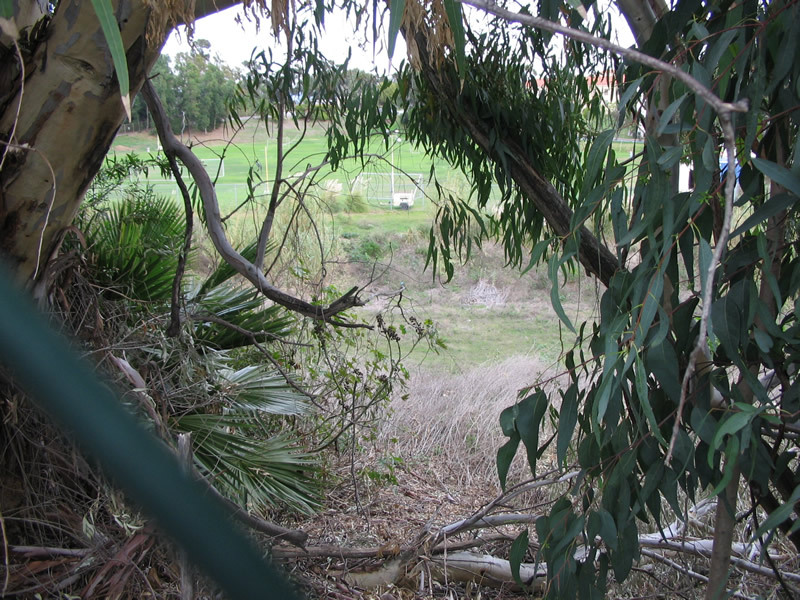 Despite a spirited campaign to get the dump properly addressed in the early 1980s, a Los Angeles-based nuclear watchdog, the Committee to Bridge the Gap (CBG) lost the battle after the Nuclear Regulatory Commission and the VA convinced a concerned public, media and key politicians that building a park on the site would be perfectly fine. Since 1985, a leased City of Los Angeles park has sat on twelve acres of this VA land. A section of the Barrington Recreation Center was carved out in the fall of 2003 for the present day dog park. The southern field of the off leash area lies over a known chunk of the nuke dump. The same kind of biomedical radiation research done at UCLA and the VA that resulted in this waste disposal site was also done at UC Davis. There, residual radiation from experiments on over a thousand irradiated beagles resulted in its dump being declared an Environmental Protection Agency Superfund site in the early 1990s. The cost of cleaning up the Davis dump was $33 million. No comprehensive analysis of the West LA VA dump has ever been done, nor any remediation of the nuclear and chemical hazards that remain buried there. According to environmentalists, digging and grading the Brentwood dump to build future projects could unleash poisons aboveground if the waste isn’t properly characterized and mitigated beforehand – a very expensive proposition. Even left alone, the ground under the location will remain dangerous for thousands of years. There is also evidence that years ago when the controversy over the dump first erupted, unusually high levels of alpha radiation had spread into one of five wells tested around the dump. This should have triggered a government investigation, but didn’t, and the nature and source of the well’s radiation remain unknown. An ongoing investigation, begun in late 2001, has unearthed a decades-long trail of government cover-ups and outright deceptions to convince the public that the site is harmless. For instance, a quarter century ago, the government claimed that there were no exchanges of radioactive materials between the university and the West LA VA; that UCLA radioactive waste was never discarded at the Brentwood dump; and that the second most redominant radionuclide at the site, carbon-14, wasn’t even dumped there. This investigation has found that those claims, and many others regarding the waste disposal site, were false. In addition, a new Bush Administration initiative to develop the VA has inadvertently divulged that the Brentwood nuclear dump is even larger than previously estimated. These disclosures have resulted in a flurry of government denials, distortions and mischaracterizations of the radionuclides known to be present at the nuclear waste site. Nuke dump or not, this land is part of the most prized underdeveloped acreage left in Los Angeles — the 387-acre VA grounds straddling Wilshire Boulevard just west of the San Diego freeway. It is being studied for development under a new plan called Capital Asset Realignment for Enhanced Services or CARES; an acronym that emerged after a 1999 report estimated that the U.S. government was spending $1 million a day on inefficient VA property. CARES is part of a larger strategy to restructure the VA to ensure its financial solvency through 2022. The West LA VA site is being eyed as one of those properties, the development of which could possibly dig up the dump. The Brentwood School is one of the most prestigious private schools in the nation and is the institution of choice for many of Hollywood’s elite. Tuition tops out at $24,800 for seniors. The school’s athletic fields served as the training grounds for Joanna Hayes, 2004 U.S. Gold Medalist in the 110-meter hurdles and have been the home of the Special Olympics since 2003 when Brentwood resident, and now Governor, Arnold Schwarzenegger presided over the opening ceremonies. A 20-year enhanced sharing land use agreement between the school and the VA expires June 2020.
mischaracterizations of the thirteen radionuclides known to be present in the waste site. Unraveling the mysteries of this forgotten dump has been encumbered every step of the way by a recalcitrant Veterans Administration not above stalling, obscuring and outright fabrications in its attempt to characterize their own contractors, PricewaterhouseCoopers, as inept and to paint the dump as benign. By savaging the work of “Team PwC,” which cost taxpayers nearly $10 million, the VA inadvertently calls into question the company’s entire analysis of the West LA VA and the other 17 VA sites targeted by CARES. The picture painted for this reporter, after five years of investigation, is of an inept Department of Veteran Affairs blithely unaware of the dangers deep in the dirt of Brentwood. Or perhaps worse, the VA knows precisely what’s buried in the dump and but is doggedly determined to build out one of the most valuable expanses of underdeveloped federal land in the nation. In 1888, early Angelino settlers Arcadia Bandini de Baker and John P. Jones deeded the VA land to the government “to establish, construct and permanently maintain” a National Home for Disabled Volunteer from the Civil War. By the early 1930s, the Veterans Administration had formed. Parts of the original grant have been used to contain the Los Angeles National Cemetery, the West Los Angeles Federal Building and Post Office, and Department of Defense facilities. Even with the San Diego Freeway bisecting the old land grant, 91 structures ranging in age from 3 to 106 years still sit on the remaining 387-acre site with 2,807,039 square feet of space. The VA is bisected by Wilshire Boulevard with the north side of the facility referred to as the Brentwood campus, home to many of the buildings used to provide domiciliary care for veterans. Much of the property today seems to exist in a time warp preceding World War II. Vast tracts appear deserted and others are covered in palm trees. Forty two buildings on the property built before 1950 are considered ‘historic’ including the Governor’s Mansion and the Wadsworth Theatre. The charming and historic building was constructed in 1939 in the Spanish Colonial/Mission Revival architectural style with a stucco finish and red clay tile roofing. A renovation of the building was completed in 2002 and includes restoration of its original Art Deco interior. The Wadsworth has played host to numerous Broadway shows, movie premieres, concerts and community meetings. On Sept. 22 a raucous CARES community meeting took place where hundreds of residents and veterans decried commercial development of the VA. Just one of the dozens of speakers, many of them decorated veterans from World War II and the Korean, Vietnam and Persian Gulf wars, said anything about the nuclear and chemical dump on the property. Nor did anyone say anything about the facility being part of ground zero in America’s Cold War nuclear research that resulted in the radioactive waste in the first place. It was clear that this controversial past has faded away. It began with the Manhattan Project to build the atomic bomb began in 1942 that resulted in the destruction of Hiroshima and Nagasaki in 1945. The Atomic Energy Commission was sanctioned by the Atomic Energy Act of 1946 and assumed operations of the Manhattan Project in 1947. The AEC was created to regulate and control the development, production and use of atomic energy for war and peace. Even before the AEC officially assumed responsibility for all things atomic a medical advisory group, led by former Manhattan Project medical director Stafford Warren, began planning a large-scale postwar biomedical research program that would continue wartime radiation affects experiments upon human subjects. These experiments and many others on myriad animals helped contribute to radiation refuse in Brentwood though no one is exactly sure what’s in it or how much. What is known is that no amount of low-level radiation exposure is safe. In late July 2005, the prestigious National Academy of Sciences came out with a milestone report that confirmed this. “The scientific research base shows that there is no threshold of exposure below which low levels of ionized radiation can be demonstrated to be harmless or beneficial,” said Richard R. Monson, the panel chairman and a professor of epidemiology at Harvard’s School of Public Health. Existing records show that the most prevalent radionuclide at the VA dumpsite is tritium, which is “heavy water” or Hydrogen-3. It’s the “H” in H-Bomb. It has a half-life of 12.3 years, meaning it halves itself during that time due to ionization. Tritium has plagued the groundwater of Boeing’s Santa Susana Field Laboratory above the San Fernando and Simi valleys. The discovery of tritium in the lab’s groundwater at four times the U.S. EPA’s standard for drinking water made headlines in 2004. In 2005, tritium levels registered fifty percent higher than the year before and were topping out at six times the water standard safety cutoff. Even with a half life of only a dozen years, the tritium polluting Boeing’s lab is still a lethal and perplexing headache after a half century of its release into the environment. Current Nuclear Regulatory Commission rules are stringent and exacting regarding this dangerous substance. For tritium to qualify for being dumped properly, the material has to be sealed in glass ampoules that are embedded in cement inside of steel pipes, which are then welded shut and put into special plastic containers. Secured tritium of this type and other U.S. rad waste debris, like glassware, syringes and animal carcasses, are considered so hazardous that they are then shipped and entombed in a 230 million-year-old salt geologic formation converted to a mine in New Mexico. The $2 billion repository is 2,150 feet underground with 11 miles of tunnels designed to last 10,000 years. The tritiated heavy water at the Brentwood site, however, was often just poured in holes dug at the site. It was also put in bags and barrels with other radioactive waste. These dangerous practices were forbidden eleven years after the dump had closed in 1968. In addition, liquid and solid waste were no longer allowed to be mixed together or simply tossed together with animal carcasses. “Do not mix radioisotopes of short and long half-lives, or gamma with beta emitters,” one West LA VA memo instructed November 26, 1979. New measures to strictly control and cease production of radioactive and chemical waste also took shape. Perhaps it was too little too late. Toxic chemicals were also dumped during the sixteen years that the VA dump was active. In 1981, UCLA admitted that it had ditched known and unknown chemicals at the site in 4 to 8 foot deep holes. The chemicals included toluene and dioxane. Toluene is an organic liquid with a sweet, benzene-like odor. The most common chemical use for toluene is to make benzene and urethane. Short-term human exposure to toluene over its government-mandated “maximum contaminant level” of 1 part per million can cause minor nervous system disorders such as fatigue, nausea, weakness, and confusion. Long-term contact can lead to spasms, tremors, and impairment of speech, hearing, vision, memory, coordination, liver and kidney damage. According to the US-EPA, toluene’s “breakdown by soil microbes is slow,” lending itself to the possibility that it’s still a problem lying beneath the Brentwood dumping ground. But records do exist and show that UCLA did use the VA dump to dispose of tritium and radioactive animal carcasses. These records were gleaned from the Committee to Bridge the Gap, the VA, and UCLA. A comprehensive examination of thousands of pages of AEC-funded experiments at the university, from the radiation program’s inception in 1948 to the mid 1960s, shows the use of at least 37 different radionuclides with half-lives of mere minutes up to tens of thousands of years. While about half of the Brentwood dump’s waste is made up of irradiated animal carcasses, both the VA and UCLA also burned radioactive trash and animals to get rid of the material. For example, from January 1954 to December 1955, UCLA’s “Burn-All” unit incinerated 3,400 pounds of “rabbits, rats, mice, excreta, peat moss, paper, etc.” contaminated by twelve radionuclides including carbon-14, calcium-45 and chromium-51. Also burned were some to the most dangerous radionuclides, “mixed fission products,” which contains cesium-137 and strontium-90, two especially deadly substances with half-lives of 30.0 years and 29.12 years respectively. The average weight of the combustibles per each of the 286 days of burning was 12 pounds. UCLA’s radiological crematorium sat outdoors on a wood box and was outfitted with an elongated stack-flue designed to be a couple of feet higher than the building roof it was attached to. “A small sheet metal pan-like cover was hinged to the stack just above the top of the unit to act as a rain protector,” according to 1956 UCLA Atomic Energy Project report. The stack apparently had no filter, according to its specifications, meaning that gases from the incinerated radioactive material simply discharged unfettered into the air. The UCLA-AEC document noted a range of radioactive gas releases emitting from the stack-flue. The highest reading for “volatile isotopes” measured escaping the chimney was two billion times higher than what Nuclear Regulatory Commission allows today for the same type of radioactive emissions. This nuclear crematorium operated for forty years in UCLA’s Health Science zone of the south campus. From 1946 through 1970, it was U.S. policy to dump rad waste in shallow land-burial sites on government property or in the ocean at AEC-licensed drop zones. Much of the VA and UCLA’s radioactive rubbish ended up being mixed with cement and sealed in 55-gallon drums, then dumped 35 miles southwest of Port Hueneme in Ventura County. U.S. EPA records show that 3,114 containers filled with radiation by-products like cobalt, strontium and cesium and source materials like uranium and thorium isotopes, were dumped at the site from 1946 to 1960. The barrels landed in depths of water ranging from 1,830 to 1,940 meters, or more than a mile down. According to CBG’s Hirsch, if they didn’t implode on the way down, they’re there today slowly corroding and leaking radioactivity in the prime fishing area. The Barrington Dog Park exhibits no signs of being the site of an old radioactive dump. There is no solid evidence that the surface of the dog park is dangerous. 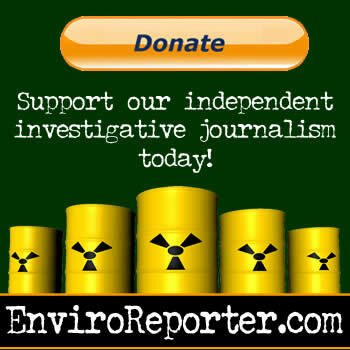 This reporter’s inspections of the known affected part of the dog park in 2001, 2005 and last month with a nuclear radiation monitor revealed elevated degrees of ionization at ground level but that could be attributed to naturally occurring radiation in the soil. The dog park opened in the fall of 2003 after being carved out of the original twelve acres that the City of Los Angeles leases from the VA for a dollar a year. It is overseen by the Friends of Barrington Dog Park (FOBDP) and run by LA Recreation and Parks. The only waste of concern is dealt with by the numerous pooper-scoopers positioned about the separate small and large dog areas. During midday, hired dog walkers show up with their rich clients’ canines and immediately do a “crap lap” picking up dog-doo so other park users don’t get too ticked-off at all their dogs. The nearly two-acre spread, with regulars like Cloris Leachman and Aaron Eckhart, has become a center of all things dog in this ritzy neighborhood. Late last July, the park was the site of the Purina ProPlan Rally to Rescue, an event that cost over $200,000 and attracted around 400 pet fanciers. The affair featured a dog parade through Brentwood Village, two-story tall inflatable pets, and cat and dog tricks all to support animal shelter pet adoption. Dennis Quaid took home a pug. CBG pointed out that the dump hadn’t been inspected for a decade from August 1969 until the group began making inquiries about it. The early inquiries precipitated a VA sweep of the area with a Geiger Muller counter and a small sampling of plant, soil and water for radiation. They found nothing, which is to be expected — the primary known radionuclides at the dump are beta and alpha radiation emitters, which can only be detected from a very short distance and are not readily revealed once buried underground. The Nuclear Regulatory Commission, formed out of the AEC in 1974, quickly dismissed CBG’s concerns. In an internal NRC communication, dated April 24, 1981, then-NRC Region V Chief of the Radiological Safety Branch, Herbert E. Book, wrote that even though, “[P]recise calculations are not possible with the available data,” there was no possible harm emitting from the tritium and carbon-14 buried in the dump. But that statement is false — the new 1981 regulations said no such thing and were referring to “tracer amounts” of tritium and carbon-14. The operative phrase in the `81 regulations was “the licensee may dispose of specified concentrations of these materials without regard to their radioactivity.” Those concentrations were indeed very small. “In light of this and our recent decontrol of biomedical wastes containing H-3 and C-14, it would seem totally irresponsible and incredible if the NRC should decide that controls or conditions should apply to the future use of the property,” wrote Book, forming the crux of the NRC arguments used to justify building the Brentwood park with no proper characterization or cleanup. Thirteen years after this statement was made, one of the “other such locations,” the UC Davis nuke dog dump, was discovered to be so hot as to make it a Superfund site. A Superfund site is any land in the United States that has been contaminated by hazardous waste and identified by the U.S.-EPA as a candidate for cleanup because it poses a risk to human health and/or the environment. It is the worst of the worst. This wasn’t true. One sample tested high enough in alpha radiation in April 1981 to trip a law-mandated characterization of the well. This was never done though the law, which is part of the California Code of Regulations – Title 22, had been on the books since 1979. A high alpha reading suggests an unnatural source for the radioactivity, possibly from the dump, which could be very dangerous considering what’s already known to be in it. The well, which had been in operation since 1928, was closed in 1996 due to chemical contamination not connected to possible offsite radioactive contamination from the Brentwood VA dump. In early February 1982, the VA responded to a set of questions that CBG had submitted two weeks earlier. The response included three major fabrications that the VA’s own records bear out. The VA declared that it didn’t exchange any radioactive materials with UCLA when records show that it did under its joint AEC experiments. The VA falsely stated that there was no acceptance of radioactive waste from UCLA yet the records show that tritium and carbon-14 waste from UCLA were deep-sixed in the Brentwood dump. And, most incredulously, the VA avowed, “So little C-14 was utilized… (it was) not buried on VA property to the best of our knowledge.” This statement didn’t gel with the VA’s own documents that show C-14 as being the second most prevalent radionuclide in the dump. Hirsch pressured Braude to arrange for an LAPD helicopter flyover with a police photographer. It was a ride he would never forget. By December 1982, the LA City Department of Recreation and Parks had concluded that the twelve-acre park would “pose no conceivable health risk to the public.” On June 16, 1983, the parks commission approved the project on a 3-1 vote despite protests from the newly formed Brentwood Citizens for a Safe Park, a group that was made up of about 300 apartment and condo dwellers on Barrington Avenue. In early May of the next year, the city signed off on the $1,044,000 project and the park was built and opened on May 27, 1985. Braude and Beilenson threw out the first balls on a newly create baseball diamond that stretched over the nuclear waste dump in deep centerfield. But the park soon faced a new danger. In February 1986, the VA declared 109 acres of the Brentwood facility to be excess federal land as part of the Reagan Administration’s long-range goal of reducing the federal deficit. Even though that acreage for possible sale was later shrunk to 80, it still included the new park. Eventually, the proposal to sell off the land was dropped after vociferous protests by Braude, Beilenson and the Brentwood community that helped result in passage of the Cranston Act of 1988 which protects the northeastern 109 acres of the VA from commercial build out. In 2001, Rep. James T. Walsh (R-NY) tried but failed to implement an April 2001 initiative entitled “Plan for the Development of a 25-Year General Use Plan for Department of Veterans Affairs West Los Angeles Healthcare Center” as part of the 2002 fiscal year VA-Housing and Urban Development Appropriations Bill. The most controversial aspect of the plan was repeal of the Cranston Act. Rep. Henry Waxman (D-CA), in whose district the West LA VA lies, succeeded in nixing the measure with an amendment that prohibited funding of the plan. Out of 26 million veterans nationwide, 2.3 million live in California making the West LA VA one of the most important veteran centers in the United States. There are more veterans living within fifty miles of the facility than in 42 other states combined according to the California Department of Veterans Affairs. The Los Angeles Homeless Services Agency recently estimated that of the 82,291 homeless in the county, 15,420 of them are homeless vets. The VA estimates that its West LA staff has served 60,000 homeless veterans over the past 10 years. This prime real estate is an asset to the beleaguered VA, which is in deep trouble financially in part due to the cost of caring for the scores of wounded and maimed returning from Iraq. As of the end of March, over 17,400 American soldiers had been wounded in the war. The Army’s Surgeon General estimates that thirty percent of troops returning from Iraq have developed stress-related illnesses including anxiety, anger, depression, nightmares and concentration problems. More than 360,000 soldiers have already returned from Iraq and Afghanistan, according to the American Legion, and over 86,000 have sought health care from the VA. The number of VA-treated vets rose by 5.2 percent in 2005, an increase of 3.2 percent over the department’s original projection. Currently, the average annual cost for a single veteran’s health care in the VA system is approximately $5,000 a year. After repeatedly assuring Congress that the VA was on sound footing, the White House had to ask for an additional $2 billion to cover the VA last July 14, this after asking for $975 million just two weeks prior. The requests for increased funding resulted from the VA’s underestimation of the number of vets seeking health care as well as the escalating costs of health care and long-term treatment. Ultimately, the 2006 President’s budget for the Department of Veterans Affairs provided approximately $70.8 billion for veterans’ benefits and services. Despite veteran groups’ criticism of the new budget, they were thankful that they beat back two Bush Administration proposals that would have charged veterans joining the health care system a $250 enrollment fee and would have increased prescription co-payments from $7 to $15. The meeting, which lasted over ten hours and was attended by around a thousand people throughout the day, was held by a panel that was appointed by VA Secretary Jim Nicholson. Only one audience member asked what was happening with toxic materials on the VA property and the status of its remediation. The panel seemed unaware of the dump and offered no suggestions. They did, however, issue nonbinding recommendations to the Nicholson immediately after the hearing, although two more public meetings are scheduled. Their six guiding principles included reaffirmation of the Cranston Act. Ignoring the fact that the quarter in question is actually area “A”, the submitted questions included asking where Team PwC got their information, who excavated the waste and where the waste went. The half-life comment about the dump reflected in this passage doesn’t make sense scientifically as radionuclides all have different rates of atomic decay. This knowledge is one of the basic fundamental principles of radiation measurements. I asked Chrencik what exactly “10 half-lives” referred to, and if it implied that there is only one radionuclide in the disposal areas, namely tritium (H-3), the most prevalent radionuclide in the disposal areas according to my research. Finally, I inquired about who concluded that the wastes emit no more radiation than non-radioactive material, who tested the waste and what did they test the waste with and who did the off-site monitoring well sampling and where are those wells located. I asked what Team PwC meant by “all” the waste sites are buried under “fill material areas leased to Brentwood School for use of athletic fields.” Did this mean that there are no other radioactive medical waste sites not underneath these fields and who made this determination and when? Who determined that the radiation was “below threshold limits” and when? Why were biomedical wastes encountered “removed to a suitable off-site disposal area” if they are not considered a “significant environmental hazard at this time”? What kind of “encapsulation” of these wastes took place and by whom and when? Long Beach-based Fallen, an Operations Officer who is the VA’s point person on the West LA VA CARES initiative, arranged for a face-to-face interview at the VA in late January. The meeting commenced with addressing questions about the radioactive waste under the Brentwood School athletic fields that, according to Fallen, began to be constructed in 1999. Team PwC had stated that in its report that construction of the facilities was from 1996 to 1999. Actually, the building of these facilities started with grading of the land in June 2000 according to a February 2002 letter from the California Department Health Services to Ben K. Spivey, Chief, Occupational Safety and Health and Senior Industrial Hygienist for the West LA VA. Spivey accompanied Fallen in this conclave which also included VA Asset Management personnel Laurel Daniels and Katherine Steinberg Bluth. What followed was a series of contradictions and prevarications that can only be described as baffling. Not only did the discussion include misinformation that even a novice in radiation science would catch, so did the written documentation copied for this reporter during the course of two hours of discussion. “It’s no longer radioactive and the half-lives are very short-lived; the carbon-14, phosphorus-32 and the tritium,” Spivey continued, now making the dump seem completely inert. He was at least correct in one aspect; the half-life of phosphorus-32 is a mere 14.29 days making it, indeed, short-lived. But Spivey’s repeated inaccurate assertions regarding tritium and carbon-14 betrayed either an ignorance or guile that perplexed this reporter though I’ll admit that I was taken by the utter aplomb with which these fallacies were imparted. The group went on to emphasize that the area that they claim the dump is confined to the arroyo below the Barrington Dog Park and buried under 25 feet of debris and was found to be safe in a quarterly EPA inspection that was just completed two weeks prior to the meeting. “In addition to being fenced, there are no public activities in that area,” Fallen said. Spivey also contradicted numerous official documents, and two maps from the 1970s and 1995, that confirm that part of the dog park is partially located over the old nuke dump. “There was no radioactive material buried under the Brentwood lease site,” he said referring to a diagram of the area that was created by Locus Technologies, a Walnut Creek-based company with offices in downtown Los Angeles. Inexplicably, the late 2000 Locus map showed the Barrington Park baseball field and dog park common fence, adjacent and above the arroyo, making an angular bend that conveniently keeps the lease area from overlapping the radioactive dump. In fact, the fence makes no such jog – it is straight and the lease area is clearly over part of the waste site in the earlier maps. I asked Spivey if this new rendering meant that the dump wasn’t under the dog park. He nodded affirmatively. The VA foursome seemed most emphatic when it came to the rad waste PwC had reported as being under Brentwood School’s athletic fields. Again, the 2000 Locus report was cited as proof of that no radioactive waste was found under the soon-to-be athletic fields. “Six soil borings were drilled at the location where apparent medical incinerator ash was encountered prior grading operations,” the report said while stating that the material was tested for metals but not radiation. “We actually had a Geiger counter with us and we monitored every load that came out, every load that they were excavating” said Spivey. “It was dead inert debris that posed no harm to anyone.” Spivey displayed a photo album that showed these ash piles and one picture had a man with a Geiger counter. The Locus report also had a map that marked the locations of these debris pits, including one with the locations of the ash dregs. This reporter practically had to wrestle a copy of it from Fallen. “You don’t need that,” she protested but soon relented when it was clear that it wasn’t going to be handed back to her. The Locus map show three considerably-sized pits, up to hundreds of feet long, euphemistically called “buried historical solid waste disposal area(s).” The two largest are in the “lower bench” of the facility and look to have been located where the track and tennis courts are today. The third ash pit was found in the “upper bench” either under or by one of the school’s current baseball fields. Considering the so-called ‘expertise’ encountered in this meeting, I could only imagine what the never-seen PwC answers were to my questions. What secrets was the VA hiding? “Let’s hope that you debunk the myth,” Daniels said as the meeting came to a close. When asked what myth she was referring to, the VA official fell silent. Given the shaky science and baseless hyperbole surrounding the Brentwood waste disposal site, and the fact that it’s in one of the most affluent neighborhoods in Los Angeles, it is no surprise that the VA is nervous about the final Team PwC report. “VA is not in receipt of PricewaterhouseCoopers’ final report submission and is therefore not able to provide comment on a document clearly identified as draft with a disclaimer regarding factual and editorial errors,” wrote Susan Pendergrass, DrPH, Director, Office of Strategic Initiatives in a Feb. 23 follow-up letter. Eliciting true and accurate information about the CARES West LA VA conundrum may be made easier by a March 27 letter to VA Secretary Nicholson from the House of Representatives Committee of Government Reform. The letter, signed by the committee’s chairman, Rep. Tom Davis (R-VA), and Waxman, the ranking minority whip, requests the contract between the VA and PricewaterhouseCoopers, PwC and its contractors and a whole slew of documents related to the CARES process at the West LA VA.
With the advent of the CARES initiative, how the community handles the possibility of development of the old nuclear and chemical dump remains to be seen. But for the few folks left that remember the lost dump, the idea of building out the property is an anathema. There is a distinct difference between the failed development at Ahmanson Ranch and the VA’s Brentwood nuke dump – Washington Mutual didn’t know of the pollution problems with their property until this reporter exposed them. In this case, the Veterans Administration either doesn’t have a clue as to the radionuclides in their dump because of a poor understanding of radio-science or, perhaps worse, the department has made a conscious decision to ignore them. It is unlikely that either scenario will be comforting to the residents of Brentwood.